New Free State Garden of Hope: First of its kind for people living with HIV and Aids. Sandstone cycle, which symbolises unity and infinity and also depicts life journey. Our past actions become our future. Wall with mural represents breaking the silence about the disease and bringing it into the open where there is hope. 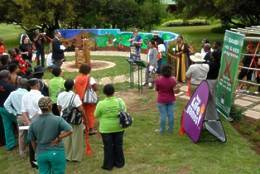 This Garden was officially opened on the 1st of December 2009 in the Free State National Botanical Garden, simultaneously to commemorate World Aids Day. The event has been put into place as the collaboration of the Garden Team and Education team in which the education team has played a tremendous role putting the overall commemoration plan and opening together. This event was attended by Representatives from different Aids and Wellness units around the Free Sate, among these representatives there were Delegates from Botanical society South Africa, provincial and National, Free State Department of Health, the Assistant Director of Wellness of the South African National Biodiversity Institute, Director of Aids Training and Development from private organization called Sam and Sis as the guest speaker, as well as delegates from United Nations Aids spectrum. The celebrations activities were outlined by the Free State National Botanical Garden Choir, violin players from Joe Solomon Primary school, Paratlatla dance by Kgato primary school and candle-lighting by staff members of the Free Sate National Botanical Garden. Mr. Peter Gavhi, Curator of the Garden and Ms. Zaitoon Rabaney, the operations Director of Botanical Society of South Afrrica (BotSoc), cut the ribbon to officially open the Garden of Hope. The event was commemorated successfully and the vuvuzelas were blown for a minute at 12 o’clock to make noise about the pandemic HIV and AIDS. After the official opening of the Garden and the commemoration of World AIDS Day, Mangaung Aids Unit offered voluntary counselling and testing where more than 15 staff members were tested. Special thanks to the Free State Environmental Education team, the Garden team, DigiPix Photography, Botanical Society of South Africa and all the people who played a part in the activities to roll out Commemoration of World AIDS Day at Free State National Garden.